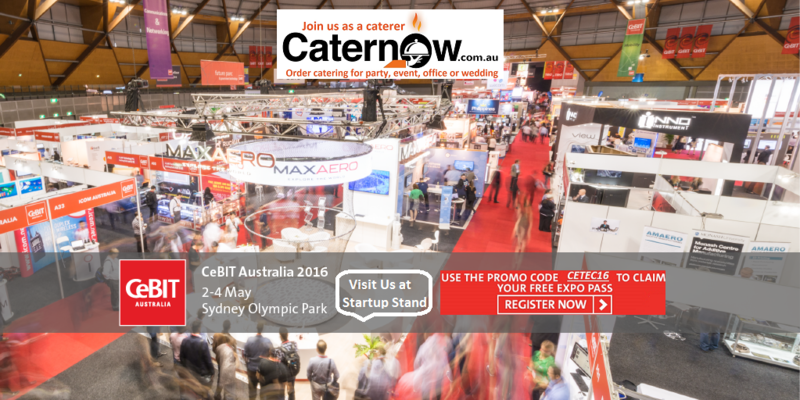 It was the time when we were preparing a launch of Caternow.com.au and just came to know that CeBIT 2016 is happening. As a startup we decided to take up the opportunity to exhibit in CeBIT 2016. It was a big step for an early stage startup. We were excited and finally we got the space. To give a little idea about CeBIT 2016: It is Asiapac’s major business and technology exhibition supported by NSW government where more than 300 organisations exhibited including 70 startups. CeBIT was attended by more than 15,000 delegates and it had showfloor theatres and conferences on variety of topics such as Cloud, Big Data & Analysis, Cyber Security, Financial Tech, eHealth, eGovernment, Mobility, Digital Marketing, Internet of Things and Startup. To give a boost to entrepreneurial spirit there was a PitchFest where selected 9 startups including 3DBRINK, Blrt, Health Care Innovate, NetHealth-Data, Open Orbit, Operations Intelligence, Propeller Aerobotics, Shippit, XIGROM. It was really a great experience to see startup pitching for their life. The competition was won by NetHealth-Data. Now let’s talk about what we got out of this exhibition. For a startup when there is a budget crunch at every step, it was a major decision to invest in exhibiting at such an event. But we took the courage to do it as we were launching our website and there was no better place to start but Cebit2016. Initially we thought that we will not get many visitors but as day progressed we started receiving huge number of visitors who had interest in knowing what we do. We expected three types of visitors: customers (corporate/casual), caterers (restaurants, chefs, catering businesses) and investors. We had a range of visitors and they took really good understanding of Caternow.com.au, plus a flyer, business card and a branded pen (so they will remember us). It was really great to connect with variety of people who are looking to know more about Australian startups and technology trends. 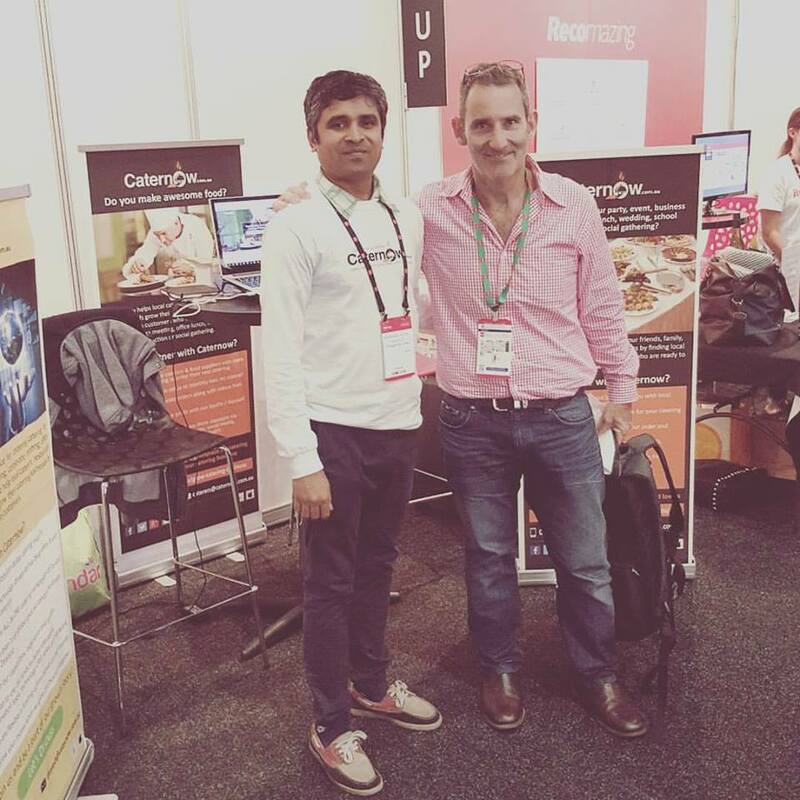 Our memorable moment was when Steve Baxter (An investor, entrepreneur from Brisbane and one of the sharks on the Australian television series Shark Tank) visited our stand on 4th May 2016. He was really down to earn and curious to know more about what do we do at Caternow. He also given me a chance to take a photo. Thanks Steve. That’s all for now. It was a great event to spread the awareness about Caternow.com.au and we look forward to being a part of it again next year. Please login first to invite friends. Welcome to Caternow, Australia's premier and favourite online catering marketplace with best local caterers in Melbourne, Sydney, Brisbane, Adelaide, Perth and Canberra. It's like an Airbnb for catering. We provide fresh, gourmet and professional catering delivered to your door for all occassions including birthday parties, cocktail parties, baby showers, BBQ, picnics, business meetings, corporate events, training, seminar, exhibitions, funerals & wakes, memorial & farewells, school functions, graduation ceremonies, and weddings. Looking for a function or event catering? We help you find suitable caterer with easy to order online catering menus for corporate, party, event, finger food, buffet or wedding. Caternow also helps Sydney caterers grow their Sydney catering businesses by giving them access to our large customer base. We are the catering people who made catering simple and our happy clients are the result of our best Melbourne catering services by awesome Caternow team. Our mission is to create unforgettable and unique experience for your event.